Did you know that some Americans are not bothered that they have no emergency fund? According to a new report published, almost 1 out of 5 survey respondents revealed that they feel okay even without emergency savings. The report also revealed that 47% of respondents, although they have savings, cannot cover less than three months worth of expenses. Again, it is revealed that they are okay with this – even going as far as to say that they are comfortable with it. While we may be able to survive at the moment without an emergency fund, that does not mean it is okay. You might feel like you are okay right now – but that will not last for long. 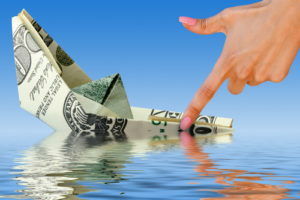 Soon, you will find yourself going through a financial crisis because you were not prepared for an unexpected expense. You may be able to survive going from one paycheck to another. But if you do not have savings for emergencies, where do you think you will get that money? Your complacency and optimism are admirable but it is misplaced. You cannot feel positive about your finances if you have no emergency fund. If you refuse to do something about this because it “feels ok” – then you are in trouble. This is one of the financial decisions that will affect your future. It does not matter how hard you work right now. Life has a way of turning your life around when you least expect it. Going without an emergency fund does not necessarily mean you will not survive a financial emergency – but it will make the rebound very hard. There are several ways that having no emergency fund can put your life in jeopardy. Did you know that the number 1 cause of stress in America involves their finances? This is according to a 2018 study by Northwestern Mutual. 44% of respondents admitted to money being their main cause of stress. The 2nd and 3rd on the list are personal relationships (25%) and work (18%). As you can see, there is a huge gap between the first and the other two causes of stress. You can just imagine how much influence your finances can really have in your life. This is the reason why you need to make sure you have enough emergency funds. When you are faced with an emergency, especially one that involves a life or death situation, it will immerse you in very stressful conditions. It will be worse if you know that you have no emergency fund to get yourself out of that situation. The added stress might lead you to take drastic measures that could make your situation worse. It can even make your health condition go down. Instead of just dealing with one problem, you might end up opening more issues to deal with until it overwhelms you. We mentioned that it is possible for you to make the wrong decisions when you are stressed. One of these is debt. We are not saying that you need to eliminate debt from your life. It is okay to use debt because you need to keep your credit score high. But you want to do it under your terms – and not because you have your back against the wall. That is a dangerous position to be in. Then again, if you do not have an emergency fund because you did not feel the need for it, then debt is the only solution for you. This will not immediately destroy your finances – at least not if you can pay it back. But if not, then you will be in big trouble. So to avoid this, why not just change your mindset and give more importance to your emergency fund. By choosing not to have an emergency fund speak volumes about your financial security – or the lack of it. Unfortunately, a lot of people feel this way. According to reports, 41% of US consumers feel financially insecure. The same report revealed that this statistic already declined from 46% in 2017. However, it is still a big percentage. It is never a good thing for anyone to feel financially insecure. When you have an emergency fund, you will feel a sense of security. You know that if anything happens to you or your source of income, you have some money to help you survive. Even if it is only temporary, It is one less thing to worry about while you try to find a solution to your current dilemma. To be honest, having no emergency fund will not bring the end of the world. But it will make you more vulnerable to it. Do not underestimate the ability of this fund to help you face unexpected events in your life. Now that you know how a lack of emergency fund can be dangerous, it is time for you to start making an effort to build it up. Since unexpected situations come when you least expect them, you may want to do this as quickly as possible. Here are some tips that will help you accomplish this. Start by living a frugal life – even for just a couple of months. This means you spend only on what is important to you. There will be no unplanned expenses and you will strictly stick to your budget. If it is not necessary for you to survive, you need to think twice before you spend on it. Some people might feel like living a frugal lifestyle can be very restricting. However, if you learn how to effectively approach frugal living, you can really get a lot of savings. Do not worry because this is only temporary. You just have to build up your fund as fast as you can. When you have at least $500 in your fund, you can stop living a frugal life. After that, you can continue saving a small amount until you reach $1,000. Lowering your expenses, even if you are following a frugal budget is sometimes not enough – especially when you come from a no emergency fund situation. To save faster, you may want to take extra jobs. Look for online jobs that you can do for a couple of months. A lot of jobs online are on a per-project basis. Once you have saved enough, you can stop taking extra jobs. This is a great way to give your income a boost and build your emergency fund faster. If you want to diversify your income, you can choose to continue getting extra jobs every now and then. The extra money can be used for investment purposes to help you increase your personal net worth. Finally, if you want to quickly solve your no emergency fund situation, you might want to check some of your saving goals. Check your budget priorities and see if there are those that can be put in the backseat for now. For instance, you may be trying to save for a vacation. Put that aside for now and use the contributions to give your emergency fund a boost. You can also choose to postpone saving for a new TV or something else that is not really needed in the near future. Once you have reached the ideal emergency fund savings, you can start saving for your other goals again.